Following the scenic and tranquil Boulder Creek for most of the way, this popular path travels for 8 miles through downtown, past several community parks, by the well-known University of Colorado at Boulder, and through Boulder Canyon. The multi-use, paved path attracts lots of bikers, walkers, and runners. There are really three ‘sections’ of the trail, each quite distinct. The middle section can be more of a ‘runseeing’ tour of Boulder. The eastern section starts near the Stazio Ballfields at Arapahoe Ave. & Old Tale Rd., passing through grassland and several parks. At the 3 mile mark, pass through the Colorado University eastern campus, and follow for 1 mile to the northern end of the Univ. of Colorado campus. Miles 4-6 follow Boulder Creek, through Central Park, downtown (Museum of Contemporary Art, Public Library). 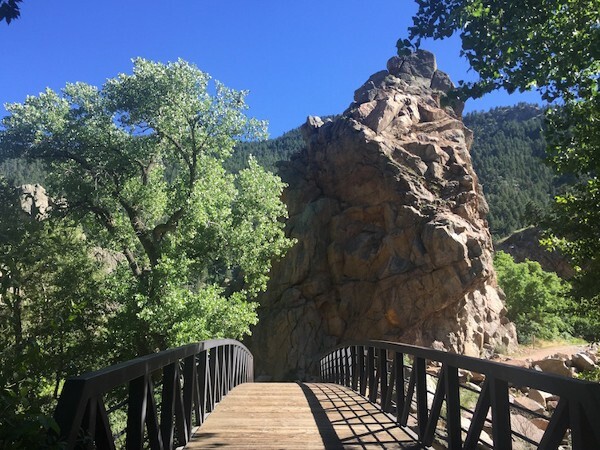 The western section of the trail, miles 6-8, start at the mouth of Boulder Canyon at the famous Eben G. Fine Park which is one of Boulder’s longstanding landmarks. This last section, paralleling Boulder Canyon Rd., is hillier. Note that many other local paths intersect with Boulder Creek Path, so make sure to stop and check that you are on the right trail. Add-Ons: Many additional trails intersect the Boulder Creek Path. Also, the campus of the Univ. of Colorado is great for running. 8 miles (13 km) one-way -- choose a section!